Artwork of the Yellow Devil from Mega Man. The Yellow Devil (イエローデビル, Yellow Devil) is a boss hailing from the Mega Man series. The Yellow Devil using its splitting attack in Mega Man. The Yellow Devil originally appeared in Mega Man, where it served as the stage boss for the first stage of that game's Wily Fortress. It used attack patterns similar to its appearance in Smash 4, splitting into multiple parts and moving across to the other side of the stage. The Yellow Devil is notably a hard boss in the Mega Man series since the split parts of it make it hard to dodge and predict, and that it will repeatedly split again after opening its eye (its weak point) to fire a beam at the player. The Yellow Devil's weakness was the Thunder Beam, which was obtained by defeating Elec Man. The Yellow Devil reappeared in the remake of the first game, Mega Man Powered Up, where it spoke in its own language comprised of the word "Bumo". The playable Robot Masters also make an attempt to communicate with it; Ice Man appears to understand it but says that even though the Yellow Devil has a mission, he has his own mission, too. Cut Man and Oil Man (a character exclusive to the remake) both insult it by copying its language, although Oil Man intentionally does so while Cut Man was trying to appease it. Bomb Man however demands that the Devil speak in a language that he can understand. While playing as Proto Man, he instead threatens the Devil that one shot at him will blow up his nuclear reactor, vaporizing the entire fortress. Here, it was weak to Fire Storm, which was obtained by defeating Fire Man. The Yellow Devil's splitting attack in Super Smash Bros. for Wii U. The Yellow Devil appears in both versions of Wily Castle. It attacks players by shooting lasers out of its eye and splitting into sections and moving to the other side of the stage, mimicking its behavior in the original game. It can be damaged by attacking its eye, and once defeated, it causes a large damaging explosion, similar to the Smart Bomb. The player who lands the finishing blow on the Yellow Devil is not harmed by the explosion, and any KOs caused by it will count as their attack. The Yellow Devil appears as a random event: bumping into it will initiate a battle against it in Wily Castle. If not defeated in time it transports to another spot in the map, but it retains any prior damage. The Yellow Devil trophy appears in both versions. In Super Smash Bros. for Wii U it is part of the Mega Man Trophy Box. This massive baddy splits itself into small pieces and flies across the battlefield, striking anyone in the way. Deal damage to it by attacking the eye, or hide behind its body to avoid your foes. Be careful— whoever deals the final blow triggers an enemy-launching explosion! This towering foe splits himself into small bits to move across the stage and wreak havoc. If you can get behind him, you can use him as a shield and also hit his eye more easily. Hit his eye enough and he'll explode! Try to get your opponents caught in the explosion to do some real damage! Due to Wily Castle returning, the Yellow Devil returns as a stage boss in Super Smash Bros. Ultimate. The Yellow Devil's sprite from Mega Man. Unused artwork for the Yellow Devil. The Yellow Devil on Wily Castle in Super Smash Bros. for Nintendo 3DS. When Mega Man was originally released outside Japan, the Yellow Devil's name was changed to "Rock Monster" due to Nintendo's policy against religious references at the time. This change was reverted in the Sega Genesis remake Mega Man: The Wily Wars, and the original name was retained ever since. A similar case occurred with the Yellow Devil's successor in Mega Man 3, the Yellow Devil MK-II. The Nintendo Power guide renamed it as "Rock Monster" just like the original. The Tiger LCD game renamed the Devil as "Vengeful Villain". 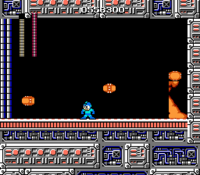 The Yellow Devil does not appear in Mega Man 2, which is the source of the Wily Castle in the background of the eponymous stage. Yellow Devil is the first third-party boss and villain to appear in a Super Smash Bros. game, when not counting minor cameos like trophies and stickers. Yellow Devil is the only stage boss to appear in both versions of Super Smash Bros. 4. Yellow Devil is the only stage boss to appear in Wii U's All-Star Mode. Despite carrying the Yellow Devil's design from Mega Man, the Yellow Devil in SSB4 seems to have the same pattern of the Yellow Devil MK-II from Mega Man 3. This page was last edited on April 19, 2019, at 02:15.